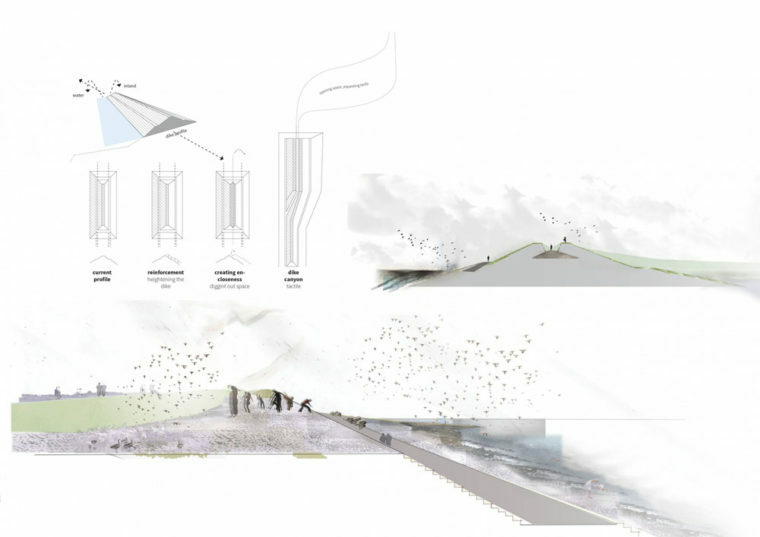 Naiara Valcarlos’ graduarion study brings a combination of theory and investigative design to bear on the sensory dialogue between a dyke landscape and the ecological phenomena of ‘new nature’ development on the island of Schouwen-Duiveland in the Dutch Province of Zeeland. 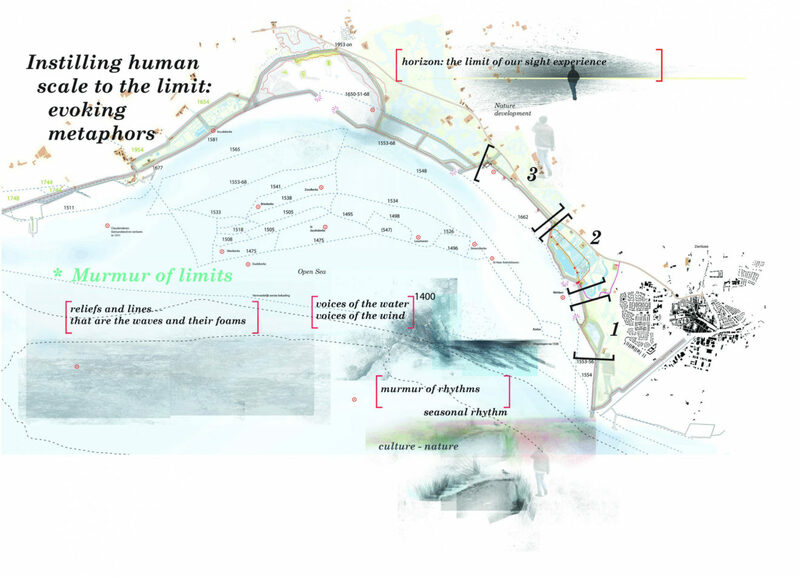 Murmur of limits, the sensory encounter between humanity and nature centres around the sensory aesthetic and the materiality of the landscape, guided by the thought that this will lead people to engage strongly with the new nature. The design of new nature is therefore intended not only to promote ecological recovery but also to create a landscape that chimes with the human scale. The palpable relationship between culture and nature on Schouwen-Duiveland is the outcome of nature combined with human intervention. New nature development has taken place in recent decades under the umbrella of Plan Tureluur, which is part of the EU Natura 2000 project. Plan Tureluur upholds the representation of the interaction between nature and culture. For example, nature reserves have been constructed on land behind the dykes flanking the Oosterschelde River, sand flats and salt meadows are protected from erosion, and marshland behind the dykes is preserved. The new nature is developed on the basis of a historicist ecological picture appropriate to the landscape dynamics that existed in the region in the 16th century. It is open to question whether this kind of approach is sufficient to assure a successful implementation and a long-term sustainable situation. To achieve that, it is important that the users of the landscape will also appreciate its value. Embodying the horizon. The dike and the tide conditioning our location. With this in mind, Valcarlos conducted observational and theoretical research into the essence of the human experience of natural landscape phenomena, her goal being to transform this essence into a design language. For a theoretical underpinning, Valcarlos draws on a range of disciplines including philosophy, art, architecture and landscape architecture. 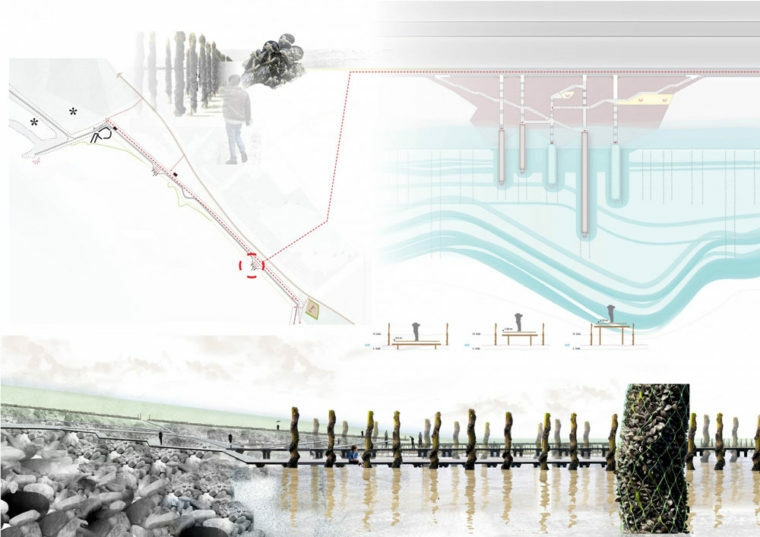 Her observational research took place at the border of the Oosterschelde with Schouwen-Duiveland. The manifestation of nature is liveliest along the dyke, where the interacting forces of human action and nature are at their most explicit. In a dynamic landscape of this kind, the dimensions of our sensory encounter with the landscape are describable in terms of scale and space (the distant horizon experienced simultaneously with direct human contact with plant life, soil and water), in terms of chronology (16th century sea dykes with inlagen, 20th century dyke breaches and the present) and in terms of the varying boundaries and rhythms in which we perceive these dimensions. Naiara’s design language becomes tangible in an illustrative design at three places. In each place, a different aesthetic metaphor provides the starting point as an embodiment of the various dimensions.